I don't do a whole lot of traveling but when I do I want to know that all my items are put away nicely. I also like to know that my clothing is safe from being soiled from my toiletry items, I have opened my suitcase to find shampoo all over and it wasn't a pretty site. 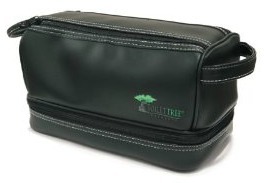 So when I was asked if I wanted to review a travel bag by ToiletTree I didn't think it would be a really nice bag, I figured it would be an ordinary toiletry bag. I was so wrong! This bag is actually beautiful, it seems strange to say a toiletry bag is beautiful but it really is! The large compartment has two zippers, there is a separate compartment on the bottom with accessories. The bottom compartment accessories include 3 TSA approved bottles for Shampoo, Conditioner & Body Wash. There is also a collapsible cup with a small pill holder inside of the cup and a toothbrush holder. I am so excited to have this ToiletTree bag. When I am not using it for travel I will be using it to store my makeup. If you are interested in purchasing one of these beautifully awesome ToiletTree bags you can find them on Amazon and for my Canadian friends it is also available on Amazon.Ca. And if you like this bag then you will probably like all the other products that ToiletTree carries so check out their website, "Like" them on Facebook & "Follow" them on Twitter!